Politician who rose to fame for his tenure as the 42nd Attorney General of Missouri upon assuming office in January 2017. 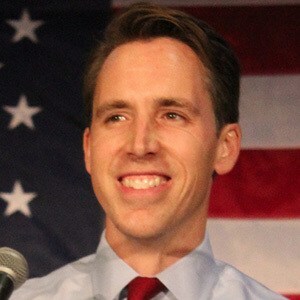 During the 2018 midterm elections, he was elected to represent Missouri in the Senate as a Republican, defeating Claire McCaskill in the process. He graduated with his honors degree in history from Stanford University in 2002. He later earned his law JD from Yale Law School in 2006. His biography Theodore Roosevelt: Preacher of Righteousness was published by Yale University Press when he was 28. He was admitted to the Supreme Court Bar in 2015, thus allowing him to argue cases in front of the Court. He and his wife Erin share two sons. He served as Attorney General of Missouri under the state's then-governor Eric Greitens in 2017.